Your child will probably start to learn how to read when he or she is in kindergarten or first grade. Some parents may begin teaching children how to read at an even earlier age. Keep reading to learn about five major aspects of reading, and how you can help your child learn to read at home. Phonemic awareness is the ability to hear and manipulate the individual sounds in words. For example, taking the spoken word 'dog' and separating it into three distinct sounds (/d/ /o/ /g/) requires phonemic awareness. Phonemic awareness is important because it's strongly correlated to reading fluency. Children who develop strong phonemic awareness skills at an early age are more likely to become fluent readers and better spellers than children who do not. To teach this at home, use items, such as hand clappers or drums, to have your child determine the number of syllables in a given word. For example, you would tap a drum two times for the word 'sister' because it has two syllables. For increased difficulty, tap the drum any number of times, and have your child think of a word that contains that same number of syllables. Additionally, help your child find items in different rooms in your home. Sort them by syllables and write words or draw pictures for each object. Alphabetic principle refers to how letters are used to represent the speech sounds of our language. Children must demonstrate the ability to associate sounds with letters and use these sounds to form words. Reinforce this at home by using an empty water bottle. Inside the bottle, place small letter beads (found at your local craft store) and other materials, such as sand, rocks and cotton balls. Shake the bottle up and whenever a letter bead surfaces, encourage your child to identify the correlating sound. Reading fluency is the ability to read a text accurately, quickly and with appropriate expression. Fluent readers read effortlessly, as if they were speaking. Reading fluency is the key to achieving reading comprehension skills. 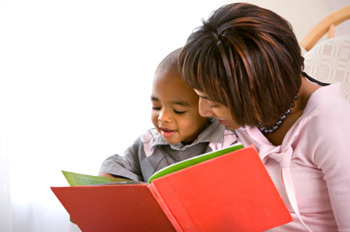 At home, you can help your child read fluently by having him or her read aloud as much as possible. Vocabulary refers to the words we must know in order to communicate effectively. Children have a more difficult time learning to read when they encounter words they don't know. They also can't understand what they're reading without knowing most of the words. Children learn most of their vocabulary indirectly through everyday experiences, but some vocabulary should be also taught directly to support reading comprehension. Successful readers are able to extract useful knowledge from text. It's important to teach children active strategies to help them become active, purposeful readers. Reading comprehension is currently taught both directly and indirectly. Direct strategies might include making predictions and relating the text to prior knowledge. Indirectly, your child will gain comprehension skills after mastering phonemic awareness, alphabetic principle, fluency and vocabulary. While reading at home, talk about everything you see and do with your children. Background knowledge is the key to your child's reading comprehension. How Much Should Parents Care About Teacher Ranks?